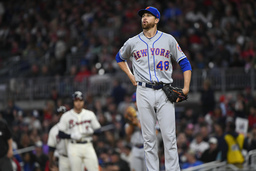 DeGrom said before the game at St. Louis on Saturday that his right elbow soreness likely was a result of altering his routine during a recent bout of strep throat. The Mets placed deGrom on the injured list Friday retroactive to April 16 because of right elbow soreness. The club had announced that deGrom would be returning to New York for an MRI of his elbow. Mets manager Mickey Callaway says they reversed course because he responded well to treatment, but will see a doctor when he gets to New York. The reigning NL Cy Young Award winner, who had been scheduled to pitch Saturday, is coming off two shaky starts. He is 2-2 with a 3.68 ERA this season.